Myths and stories about the most powerful legendary bird. For centries before Mew and Celebi, even before the other three legendary birds and humans, there were two large birds. Lugia and Ho-oh. There were no pokemon on earth at that time either so the two birds created the three legendary birds. 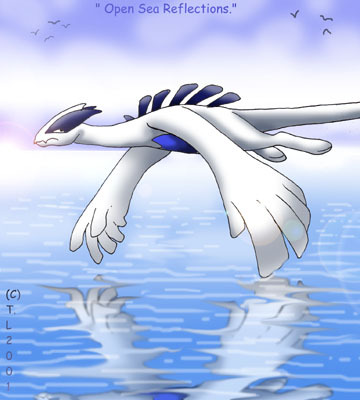 Lugia who lived in the ocean noticed at one point in it the water was soild. He called this soild water Ice. He used the ice to create Articuno the first legendary bird. Ho-oh who lived in the center of the earth where there was magma created a bird made of a more gaseous substance called he called Fire. Like Lugia he used the fire to create Moltres. To Lugia, Articuno was his daughter while to Ho-oh, Moltres was his son. They were each very proud of there children. Lugia would not tolorate Articuno being with Moltres and vis-versa. One day there chilren got too close and Lugia and Ho-oh were furious. Not at there children but at each other. The got into a messy battle in which Lugia used Aeroblast and Ho-oh used Sacred Fire. the blasts collided and made a huge explosion. Zapdos was the result of the explosion. Lugia and Ho-oh were dumbfounded as they stared at Zapdos. The seaparated. Lugia dove into the ocean and Ho-oh went to the center of the earth. They remainded there. The other three birds found a group of islands and made their homes there. Rumor has it that when any of the birds are in trouble Lugia will come an save them. For if there balance of power is disturbed the world will come to fail. 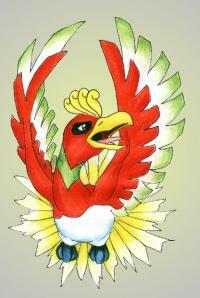 When the balance is restored, Ho-oh will heal the world and everything will be safe agian. That is their story.